Tablecloth with a large leafy botanical print. Sideways glass vases holding pink flowers to give the setting a modern lift. This screenshot, by the way, is from Top Chef’s 14th season, in South Carolina, at an estate that housed the restaurant and home of Edna Lewis, a luminary of traditional Southern cooking. Maria Bywater is the designer behind Huppahs.com and author of Sew Jewish: The 18 Projects You Need for Jewish Holidays, Weddings, Bar/Bat Mitzvah Celebrations, and Home. The craft of bartending has come into its own, and Martha Stewart endorsed jello shots for weddings. It’s shaping up to be the summer of love and the summer of serious libations. So let’s get this wedding reception started. What we need: ice carvings. 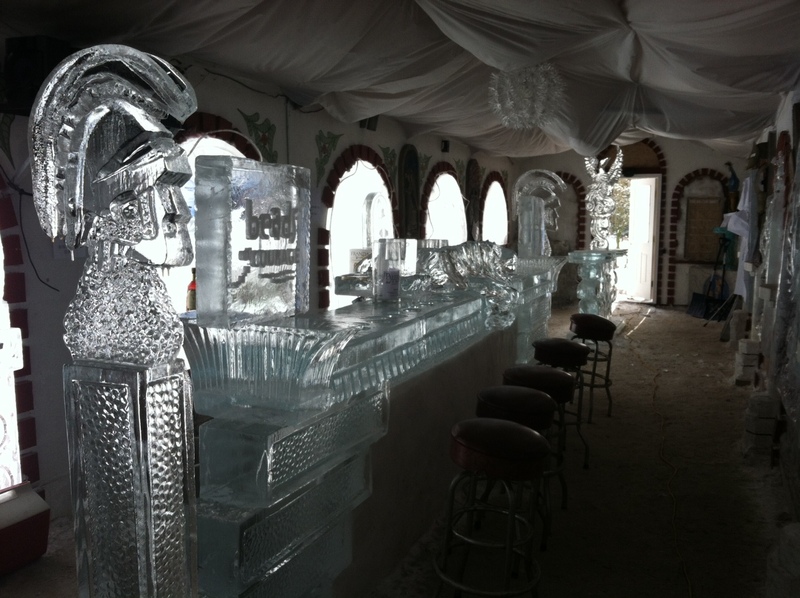 Like the Trojans flanking the ice bar in the photo. My brother Bill carved them for a charity event last year. The helmets are shot luges. Another late summer fruit pie inspired by our fruit picking trip and the popularity of pie dessert buffets for weddings: Raspberry Pie. This recipe comes from canida at Instructables.com. Visit Instructables.com for canida’s photos of the steps. Sort and gently wash berries. Set them aside to dry on a towel or in a colander. Meanwhile, make or buy your pie crust, then bake it. Use the package directions for baking a store-bought pie crust, or just bake at 350 until lightly golden-brown, 10-15 minutes depending on the recipe you’ve chosen. Homemade pie crusts may require weights to toast evenly without slipping down the sides (line with foil and add dry beans for weight if you don’t have pie-specific tools), but this isn’t absolutely necessary if aesthetics aren’t your thing. When pie crust is cool, fill with raspberries (reserve 1/4 cup berries for the glaze). Spread evenly, and mound them a bit in the center as shown below. 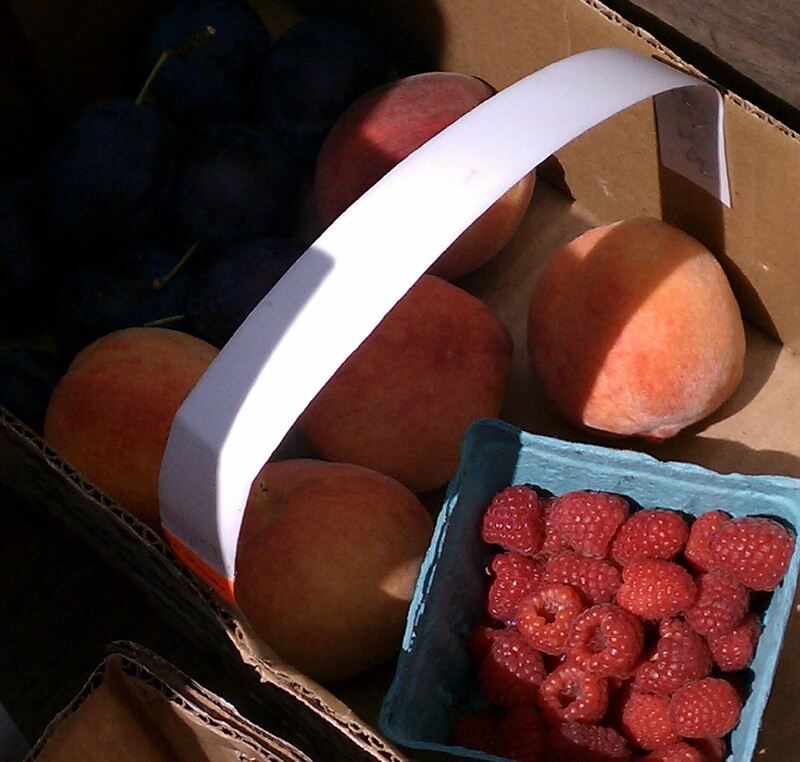 Place in a small pot the reserved 1/4 cup raspberries, water, sugar, cornstarch, and salt. 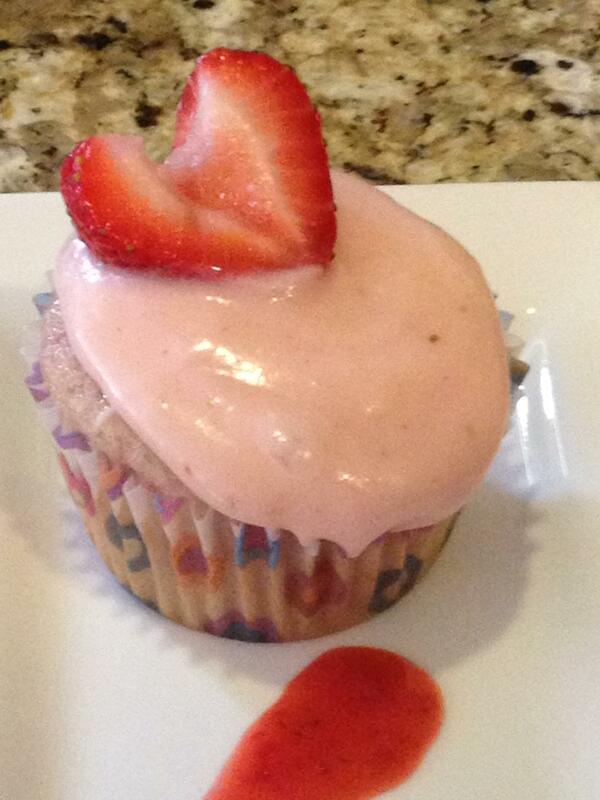 Cook and stir with a wire whisk over low heat until the sugar has dissolved and the berries have turned to mush. When sauce begins to thicken, add lemon juice and allspice (if using). Stir until glaze becomes thick, and remove from heat. Pour the glaze over your berries, spreading gently to cover the entire top surface. Allow the pie to set up for at least 30 minutes in a cool room or in the refrigerator. Raspberry pie can be stored covered in the refrigerator for two days. Only 2 days left to enter our free t-shirt contest! 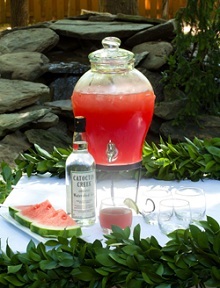 And while you’re on our new Facebook page get the recipe for our delish Summer Bliss Wedding Punch made with cool watermelon and Catoctin Creek Distillery’s kosher, organic Watershed Gin. When I was growing up, there was always one week when every homemaker’s backyard garden exploded with zucchini. All the Moms in the neighborhood would race each other to hand out the surplus harvest to people in the neighborhood who didn’t have gardens before those folks, too, were inundated with more zucchini than they could use. Those Moms would have loved to be able to hand over some of their zucchini to someone in the neighborhood who could use them for a backyard wedding. Even if there’s no one in your neighborhood offering you an armload of free zucchini, you can hit the supermarket or local farmers market for zucchini to make zucchini pancakes, a wonderful savory summer hors d’oeuvre for your summer wedding. I’ve tried a few versions of zucchini pancakes, but I like this one from Ivy Fueurstadt in New Kosher Cuisine the best. The pancakes come out nice and crispy. I’ve upped the quantities to make enough for a crowd. Like all my favorite backyard wedding hors d’oeuvres, these can be made ahead and frozen. You may want to mix this up in 2 batches. In batches, place shredded zucchini in a colander and press out as much moisture as possible. In a large bowl, mix egges, onion and zucchini. Add dry ingredients and mix. Heat oil on griddle or in skillet over medium heat. Drop a scant tablespoon of batter into the hot oil. Flatten, if desired, and fry for 3 minutes on each side until brown and cripsy. To freeze, place pancakes between pieces of wax paper so they don’t become soggy. When frozen solid, transfer to freezer bags. Reheat in 425 degree oven for 10 to 12 minutes until crispy.